Weapon Badges from years 2015 through 2018 will be tradable for Weapon Badge SP. So basically, you trade in your old badges for the SP Badges. Also, I just realized, this doesn't include Anniversary Badges; I'm still sitting on a few thousand 5th Anniversary Badges. Last edited by Anduril; Apr 6, 2019 at 10:39 AM. It was the first year they had Anniversary Badges, and I assumed, foolishly, that the exchange shop would stay around in some reduced capacity like the Weapon Badges shops did; that was the year that you could exchange Anniversary Badges for previous years' Weapons Badges, and I hadn't taken full advantage, again, thinking that that functionality would stay. If I had been more aware, I would have traded all those Anniversary Badges for 2015 and 2016 Silver Badges. Last edited by Anduril; Apr 6, 2019 at 05:52 PM. 1:1 exchange rate, so that means I've got about 7500 badges to spend. They better not remove the stone exchanges, since Invade NT availability is still bad, PD rarely pops up and UQs are dead I need a ton of Caligula, Galeru and Yurlungur. Last edited by Azure Falcon; Apr 10, 2019 at 05:14 PM. Wait, since when have Invade NT dropped from the LQs? I've never seen a single one, wasn't even aware they are available in them. If you mean boosted Ult Amduscia there was never anyone playing that, and solo UQ is a slog with the huge HP pools. The XQ is out, I'm bad at dealing with Deus and the drop rate doesn't seem good enough considering my questionable clear rate (0 Invade from maybe 12-14 clears?). Solo PD triggers are from the 2017 badge exchange and I've almost exhausted those (meanwhile I still have over 4k 2018 badges), so I'm currently relying on the treasure shop triggers and random PD EQs. Wait, since when have Invade NT dropped from the LQs? I've never seen a single one, wasn't even aware they are available in them. 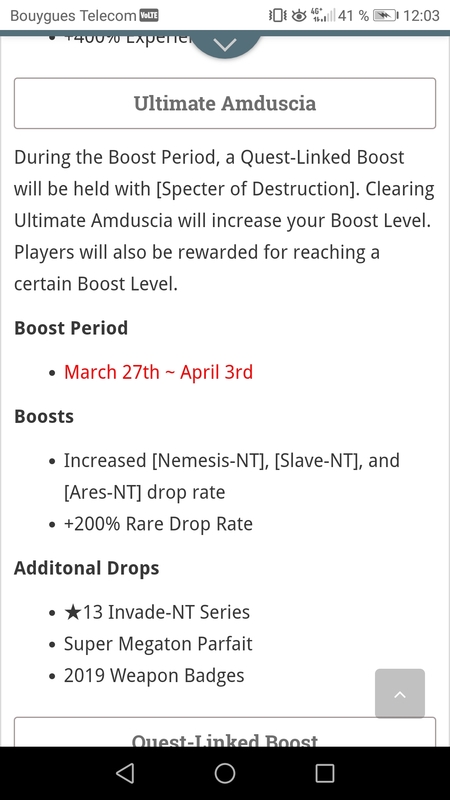 If you mean boosted Ult Amduscia there was never anyone playing thats. Meme as much as you like, I haven't had an Invade drop from these last few weeks of boosted LQs, their addition to the pool wasn't mentioned on Bumped, and they aren't on the in-game quest drop log so I didn't know they could drop. If you want to find the person with the worst luck in PSO2 it's probably me, I can roll super rare stuff when it is useless (hey, have 3 Ares Takts) but not uncommon fodder.